Farkas Bolyai (Wolfgang in German) is remembered today primarily as a friend and lifelong correspondent of Gauss and as the father of János Bolyai, one of the discoverers of non-Euclidean geometry. 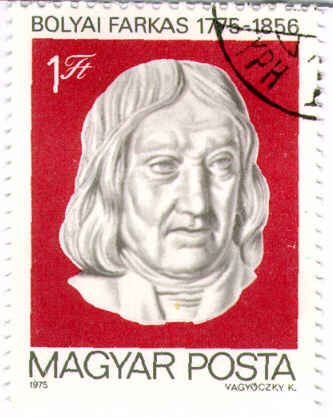 Farkas was born in the Transylvanina region of Hungary (now part of Romania) and educated in Evangelical Reformed schools in Hungary until studying at the University of Göttingen from 1796 to 1799. It was at Götingen that he became friends with his fellow student Gauss. 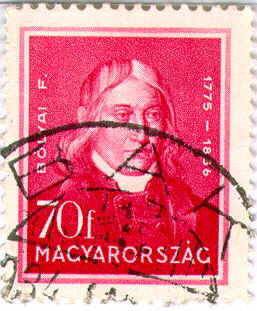 His professional life was spent as Professor of Mathematics at the Evangelical-Reformed College at Marosvásárhely. He was interested in the parallel axiom throughout his life, but his lack of success frustrated him to the extent that he warned his son János to give up its study to `preserve peace of mind'. His major published work entitled the Tentamen is an attempt to provide a rigorous foundation to geometry; it was an unappreciated precursor of the works of Frege and Cantor. It is well-known today since he appended János' paper on non-Euclidean geometry to the first volume. He reportedly requested that an apple tree mark his grave in memory of the three apples: the two of Eve and Eris, which made the earth an inferno, and that of Newton, which elevated the earth again into the family of the heavenly bodies. This may not have been done, but in addition to two stamps in his honor, he and János have been remembered with the names of three Budapest streets.